Fissure sealants are plastic coatings painted on to the grooves of the back teeth to help to protect the tooth from decay. The process is usually quick and easy taking only a few minutes per tooth. The tooth is thoroughly cleaned, prepared with a special solution, and dried. The sealant is then applied and allowed to set hard usually by shining a blue light onto it. Sealant usually last for many years, but needs to be checked regularly to make sure that the seal is intact. 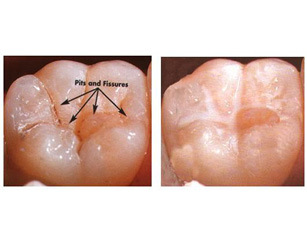 It can wear over time, and sometimes needs to be added to or replaced to be sure that no decay can start underneath it.